Hiking and mountaineering around Skadar lake is one of favorite activities in National Park. In addition of large water surface of lake, National Park hides its stupendous hinterland which waits to be discovered. There are dozens of kilometers of marked trails along Skadar Lake andAdriatic coast. More daily hikes through lovely landscapes of natural beauty of the mountain area of Montenegrin coastline offer special and unique type of recreation, so exciting and interesting that attracts an increasing number of tourists during the year. Walking the rocky paths that simply leave you out of breath, walks along village roads that alternately intersect cliffs of the coastal mountains, green corrugated areas of meadows and thick deciduous and pine forests, strolls along old paths close to abandoned hamlets, the coastal architecture surrounding with stone houses offer unforgettable experience to every visitor. 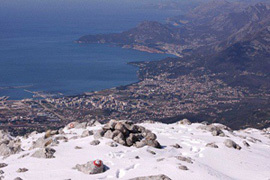 From the peak of Orjen, the highest mountain range in the entire Adriatic part of Dinaridi, in the west of Montenegro, coastal mountain transversal goes in south-east direction through the mountain hinterland of Bay of Kotor, continues over Krstac, over slopes of mountain Lovcen, Pastrovacka gora, Sozina, Sutorman and Rumija, and finally leads to Lisinje. Total length of the transversal is 138 km, and it is divided in six parts (Orjen, Boka, Lovcen, Pastrovici, Crmnica and Rumija). It includes 15 checkpoints and three mountain peaks : Zubacki kabao on Orjen (1894m), Jezerski vrh on Lovcen (1657m) and peak of Rumija (1595m). Veliki Mikulici, a village known after cult of the cross of St Vladimir. It is a cross on which Macedonian tsar Vladislav (1015) swore when he wanted to conquer state Duklja and the town of Drac ruled by prince Vladimir, kept for seven generations in fraternity Androvic from this village. Every year the cross is carried on Trojicin day in front of Litije on top of Rumija, with communion of Christians and Muslims from both sides of the mountain. 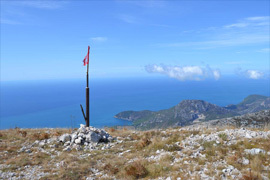 Rumija is a coastal mountain placed between Skadar lake and the field of Bar. Hikers usually take paths from the side of Bar, the option to climb it from Skadar lake is much harder and requires more effort. Crossing over the mountain from the sea side, from Skadar lake over saddle Sutorman. 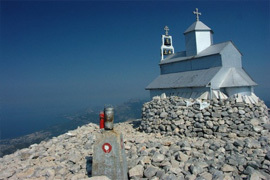 Lovcen is not only the mountain, it is a holy place that every Montenegrin or his guests see as something sacred. Something like Olympus to ancient Greeks or Ararat mountain to Armenians. The place is wrapped in history, with the Old royal capital of Cetinje, where to this day is the residence of the president of Montenegro. 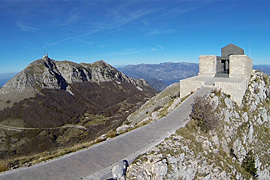 On top of Lovcen is mausoleum where the greatest ruler and writer of Montenegro, Petar II Petrovic Njegos, was buried. This path is suitable for all visitors, it requires only moderate fitness, can also be used for bicycling and riding horses. The area is rich with forest, so the majority of the path goes through it. It is possible to use it throughout the entire year. Aside from rich and diverse flora, of special value are the old bridges on Orahovštica river, gorge at Opacko hill, waterfall of the stream at Dupilo, rural continent of Dupilo village, closeness of Orahovo monastery, the old hydropower Podgor. Resting places are the viewpoint Opacko hill and the fountain in Dupilo.